What happened to actual retail perpetual securities holder in beleaguered local listed companies? In my previous posts, the perpetual securities holders were not retail ones, but generally accredited ones who traded in the wholesale market. As of now, i can only think of Tiger Air which was delisted in 2016. To be clear again just in case, Tiger Air is in a totally different market. It has Singapore Airlines as its sponsor who in turn has Temasek as a large shareholder. Hyflux doesn't. What about the similarities, Tiger Air was burning cash, racking up massive losses in their Australia, Philippines and Indonesia ventures, over ordering of aircraft and going into debt. In the blue boxes, massive losses in 9 months FY2015 and FY2014. In the green box, this is the amount of retail perpetual securities held. 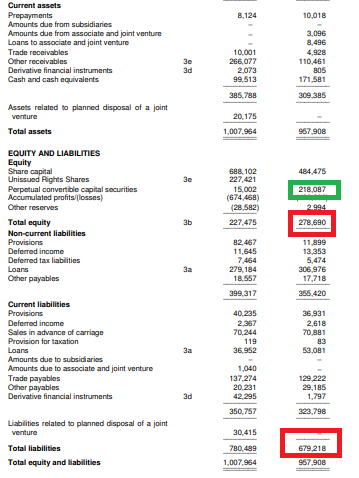 In the red boxes, it shows total equity and total liabilities respectively. As perpetual securities should really be a 'loan', the 'more accurate' total equity should be modified to (278,690 - 218,087) = 60,603. OKkkkkk.... Hyflux looks really bad. This is based on 31 March 2018 here. Please go and verify. As with Tiger Air, i subtracted the $900,000 perps ( BTWZ and N2H) from equity and added to liabilities ( Current and noncurrent). While the modified liability to equity ratio seems better for Tiger, it must be noted that unlike Hyflux, Tiger had been much more proactive in raising funds. 1) 2011, rights issuance ,raising SGD158m @ SGD 58 cents per share. 2) 2013, rights issuance, raising SGD 76 m @ SGD 47 cents per share. Tiger Air IPOed in 2010 @ SGD1.50 by the way if you are interested to know. The more i read, the more disgusted i am with Hyflux management. Hyflux had not done any rights issuance in history. In fact, i can only find daily buyback of their shares every year (except 2010 and 2013) from 2009 to 2015 ( latest 30 Nov 2015) This is absolutely ridiculous and is the opposite of what others are doing. Take note that rights issuance dilute one's ordinary shareholdings or to put it more laymanly, dilutes one control of the company. 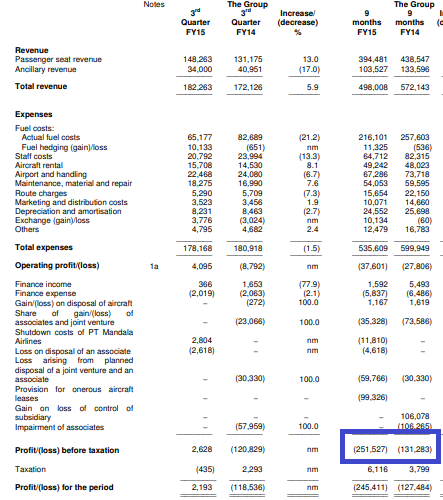 Anyway, Tiger Air's retail perpertual securities holders had theirs redeemed at par in 2016 after SIA delisted Tiger with a 41 cents offer, before raising it to a 45 cents offer. I am actually quite proud of the Securities Investor Association (Singapore) SIAS because they did speak up for shareholders about the 41 cents being not favourable. Singapore Airlines, in reponse to SIAS , justified its 41 cents price, before raising it to 45 cents.